The CAD team: Annie Warnock, Danielle Holmes, Sandra Marcelin-Reme, Jantay Gray. Each year, thousands of Illinois consumers contact CUB’s Consumer Advocacy Department (CAD), to ask a question or file a complaint about an electric, gas, or telecom/cable company behaving badly. • $62,082.76, for an apartment building that was the victim of erroneous gas meter readings. • $1,600.00, for a phone customer who was wrongly charged for service he had canceled. “I have a soft spot in my heart for CUB,” he said. 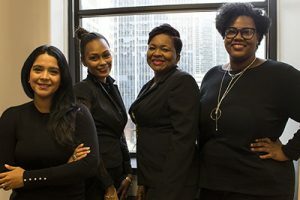 Consumer Advocacy Director Sandra Marcelin-Reme, a 25-year veteran of CUB, knows she can’t win every case, and is sad when a disconnected customer’s financial options have all been used up. But she gets a boost when consumers praise the “awesome job” her team does day in and day out. “ComEd gave me the runaround, but CUB was like magic,” said one happy customer who saved $1,200. Also, when a consumer’s been wronged, let them know somebody’s in their corner. “It’s rewarding when they realize there’s hope for their situation,” said Jantay Gray, CUB’s new Consumer Rights Associate. And listen. “Many people are sharing their stories, so a lot of the time the best thing we can do is listen and be sympathetic,” said Bilingual Consumer Rights Specialist Annie Warnock. Consumers also have a role: Read your bills, understand your rights, and communicate often with your utility. “If you don’t get good service, either end the call and try to get a different representative or politely ask for a supervisor,” Sandra said. Always contact the utility first to resolve a dispute. But if you’re concerned that you may not be getting correct or complete information, call CUB’s Consumer Hotline, at 1-800-669-5556 weekdays from 9 a.m. to 4 p.m. CUB’s team will do its best to help. NOTE: Please consider giving CUB a donation to become part of the team that’s saving Illinois consumers money. Together, CUB and Illinois consumers can achieve even more in 2019 (our 35th anniversary year)!